Few days ago, it was announced from EBU that 42 countries will participate in Eurovision Song Contest 2019 in Tel Aviv, Israel. Meanwhile, some countries have already chosen how to elect their entry. Each country has their own method for selecting artist and song for Eurovision Song Contest. Some countries choose some well known formats to select artist, some countries has developed their own formats for national selection shows, and some are still picking their entrants internally. 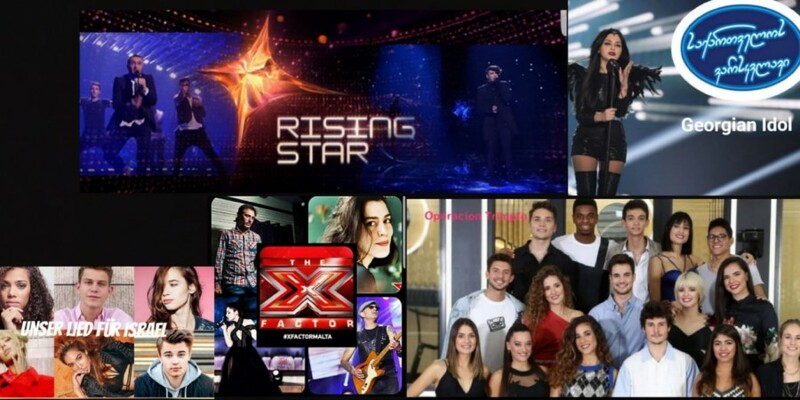 Yes, the host country will again use the talent show HaKokhav HaBa, also known as Rising Star, to select its artist. This talent show proved to be a winning move this year, when Netta won it all. Since 2015 Israel chose their artist through HaKokhav HaBa and internally found the song, and since 2015 Israel has always qualified for the Grand Final of Eurovision, until now (Israel didn't qualify for the Grand Final in the years 2011 to 2014). Georgia 2013: Nodi Tatishvili & Sophie Gelovani - "Waterfall"
The Caucasian country's Eurovision weeks have stopped in the Semi-finals for the last two years, where the artists and songs were picked internally. Now Georgia has decided to use the talent show Georgian Idol. This format gave a place in the final for Georgia in 2013, when Nodi Tatishvili & Sophie Gelovani finished 15th. Also Malta has changed its national selection show Malta Eurovision Song Contest. For Eurovision Song Contest 2019, the Maltese artist will be selected from X-Factor Malta which has important personalities among the judges: Ira Losco, Maltese representative in 2002 and in 2016, and also Howard Keith Debon, who worked together with Chiara (Maltese entry in 1998, 2005, 2009). Spain 2012: Pastora Soler - "Quédate Conmigo"
Spain will use Operación Triunfo for the second year to find their representative for Eurovision, keeping the hope to enter in the Top 20. In fact Spain has been absent from Top 20 since 2015. The best results for Spain in the last decade are the two 10th places by Pastora Soler and Ruth Lorenzo, respectively in 2012 and in 2014. Not all countries will use a talent show for their entry and Germany is among them. NDR, the German broadcaster, has announced the six German hopefuls that will compete in Unser Lied für Israel. These artists are Aly Ryan, Lilly Among Clouds, Makeda and artists who actually came from the talent show The Voice of Germany: BB Thomaz, Linus Bruhn and Gregor Hagele. Australia has chosen to select its entry for Eurovision 2019 through a new show, developed by the Australian broadcaster SBS: Eurovision - Australia Decides, which will take place on 9 February 2019. Also United Kingdom and France have created their own formats for choosing their artists and songs for Eurovision Song Contest.